The combo includes one First Flush Kit and one Leaf Trap. Designed with a removable lid, to effectively harvest rain water from household roofs. The modern designed leaf trap prevents leaves and debris carried along and are filtered through the fine screen mesh lid that also deflects mosquitoes and other insects from entering your water tank. Tank maintenance is greatly reduced and the designed angle of the product means leaves and debris are simply blown away leaving little need for cleaning. The first flush device is installed along the gutter down pipe that will feed into your water tank. As the water level in the first flush diverter chamber (110mm pipe) rises, the ball floats and rises. Once the chamber is full, the ball rests on a seat inside the chamber preventing any further water entering the diverter. The subsequent flow of clean water is then automatically directed along the pipe system through the T piece into the rain water tank. 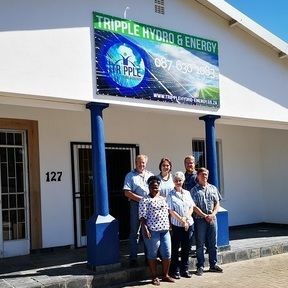 It is best to have one first flush diverter on each downpipe however a single unit can be placed close to the tank and perform a first flush for several downpipes. This will really depend on how big your roof catchment is and how clean you need the water to be. The size of your roof- The recommended minimum first flush is 4L per 20m of roof catchment area. The intended use of the water (drinking water will need a bigger first flush). (You should always check the quality of the water in your tanks before drinking it). The amount of water flushed is determined by the length of the 110mm PVC (flush) pipe attached to the first flush kit. The average is 850mm of 110mm PVC pipe will flush 50sqm of roof catchment area and a 450mm of 110mm pipe will give you an 4 litre flushing system. The 110mm pipe is not included in the DIY kit but is readily available at any hardware store. After the rain, just drain the system through the valve, ready for the next rain. The bottom of the unit (end cap) can be screwed off to fully clean the unit occasionally. During periods of frequent rain intervals, it may not be necessary to drain the first flush device every time as the roof and gutters may already be clean but this is entirely dependent on the dust conditions and rain intervals. First flush systems work best when a leaf catcher box is installed at the start of the down pipe. The leaf catcher box (available from us and sold separately) is fitted at the start of the down-pipe either directly on the underside of the roof gutter at the facia board, or to the wall. The device deflects leaves and debris away from the flow of rainwater. 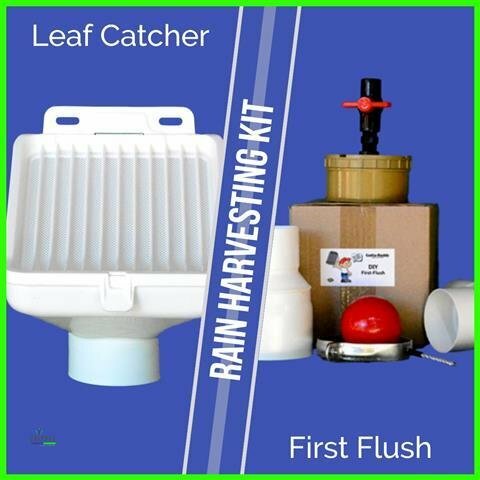 The DIY first flush and Leaf Trap carries a Manufacturing Warranty of 6 months. Terms & Conditions apply.